St John Street Then and Now ! In the early 18th century John Lambert and is wife, Susannah, were living in the building we now know as Bags of Books – 1 South Street. They had 7 children of which the youngest was James. The eldest son, John, became a china-man and business partner of Thomas Baldy. The second son, George, married and called his son James. So we have 2 James Lamberts; uncle, born 1725, and nephew, born 1741, both of whom became topographical artists. Uncle James was described by Challen in 1951 as a “stationer, &c, limner, landscape painter and organist of Cliffe” and Nephew James as a “coach and sign painter, herald and landscape painter”. (A limner is a painter of portraits and miniatures) James Lambert Snr was mainly a painter in watercolours, though sometimes he painted hypothetical landscapes in oils. He was almost certainly the better painter of the two and his paintings of Sussex landscapes of the period are still highly valued. 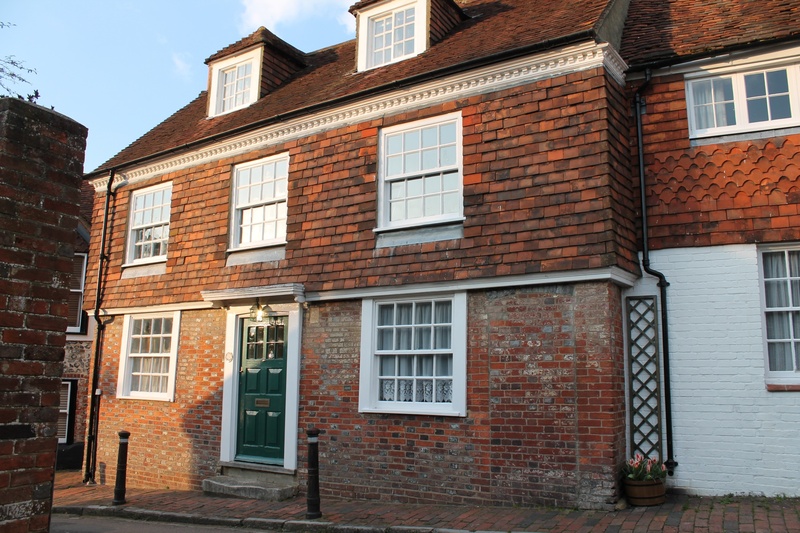 Barbican House owns many of his works, including the Burrell Collection, and some can also been seen in Lewes House. 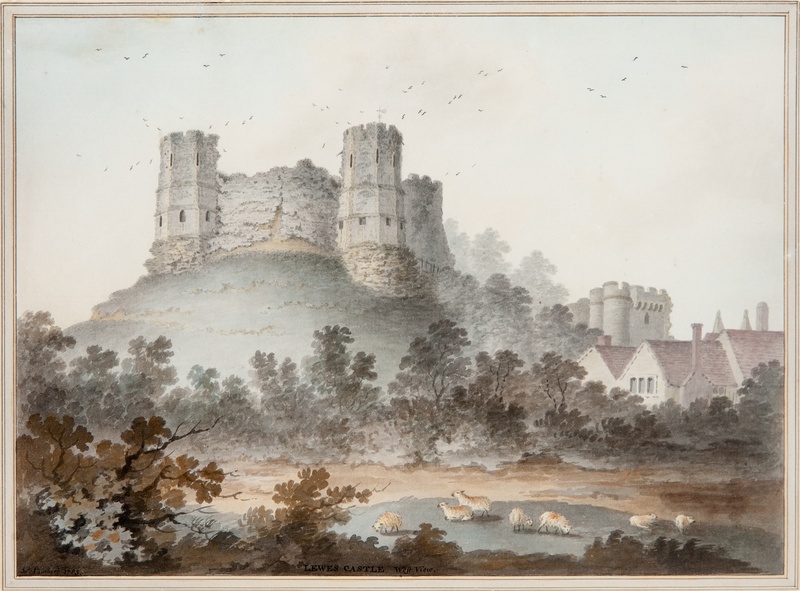 The picture above is a painting by James Lambert Snr of Lewes Castle. James Jnr was more of an architectural artist, producing detailed and carefully measured drawings of buildings. On the chancel/apse wall outside St John’s sub Castro, facing west, there are plaques commemorating the two James Lamberts and there are also silhouettes of them with frilled shirt fronts, wigs and pigtails in the Burrell Collection. A few years ago there was an exhibition of their works in the Barbican House. John and Sarah Baldy purchased Lamb House (3 Chapel Hill) when their son Thomas was about 6 years old. To the right of the front door in this photo is a stone with JSB 1716 carved into it. Thomas was baptised at Cliffe Church on 11 Nov 1710 2 days after his birth and was buried at St John’s sub Castro in March 1782, probably because St Thomas had no graveyard. Although he inherited Lamb House from his parents in 1757 and owned it for the rest of his life, he actually lived in 3 Malling Street and ran his business from there with his business partner, John Lambert. Thomas Baldy is variously described as “for many years a capital chinaman and latterly in partnership with John Lambert” (obit in Sussex Weekly Advertiser) and as “an indolent, besotted man and a fit instrument for the artful Andrew Tasker, hatmaker” (Dunvan) and as “a very courteous person and a virtuoso in various researches tho’ not a bigot to any one particular attachment” (Woollgar). Whatever the truth about him as a person, there is no doubt that he ran a successful business dealing in Chinese goods among other things. They had a warehouse in what are now the gardens of Nos. 2 and 2a Chapel Hill and No. 3 Malling Street. He was also a great entrepreneur. There are records of sales to the big houses in Sussex at a time when ‘chinoiserie’ was about to become all the rage. Thomas Baldy and Andrew Tasker, (the artful hatmaker!) were churchwardens of Cliffe Church for many years and reputedly misused church funds, diverting them for their own schemes. One such was the procuring of some angels from the demolished organ that Handel had played at Canon’s House in London and placing them above the newly acquired organ in St Thomas’s. Another was the elaborate weathervane on the church tower which has the initials AT and TB cut into it and the date 1756 in its sunburst tail. It is easily visible today.Apart from the weathervane the most enduring of Thomas’s schemes was Baldy’s Garden on the edge of the Mill Field above Chapel Hill – what is now part of the Cuilfail estate. He later made an attempt to build a large grotto just under the cliff at the back part of his warehouse and garden but “whether through want of sufficient materials or too great labour for his time of life” it was not completed.